This Best Ever Carrot Cake is simple & delicious. Perfectly moist and frosted in the classic cream cheese frosting, everyone always raves about this recipe. Preheat oven to 350 degrees, gently spray 2 – 9 inch round baking pans with cooking oil and set aside. Mix all of the ingredients listed above together until smooth and there are no chunks. Pour batter into the prepared pan, making sure to divide evenly. Place in preheated oven and bake for 25 minutes. Remove from oven and place on cooling rack until completely cooled. While cake is cooling prepare frostings. Make German Chocolate Cake Frosting first, so that it has time to cool. With the mixer on low speed, add the powdered sugar a cup at a time until smooth and creamy. Set in the refrigerator until ready to use. Once cakes are completely cool, remove from pans. Place one of the cakes on a cake stand or serving plate. 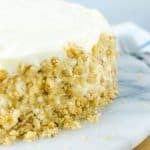 Top with cream cheese frosting. Top with the second cake, I place the cake in the fridge for 5 minutes so the middle layer can set and be a little firm. Frost the outside of the cake with the remainder of the frosting. Press walnuts on the sides of the cake if desired. Place in the fridge and remove the cake 30 minutes before serving and bring to room temperature. If serving soon after frosting you are fine to leave out.